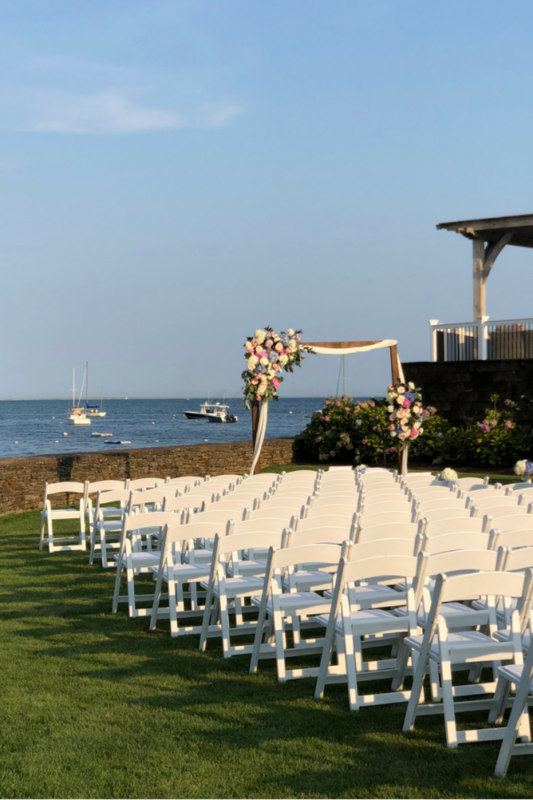 I spent this past weekend down the Cape for a beautiful wedding celebration for one of my college girlfriends. The forecast wasn’t looking great, but the wedding day was perfect – not too hot and also not raining. The next day we had a party on the beach and while the sun wasn’t out, it was fun to have some drinks on the beach in sweatshirts anyway. We only have three weddings this year, two of which are this month, and admittedly I was late to the game with picking out something to wear. 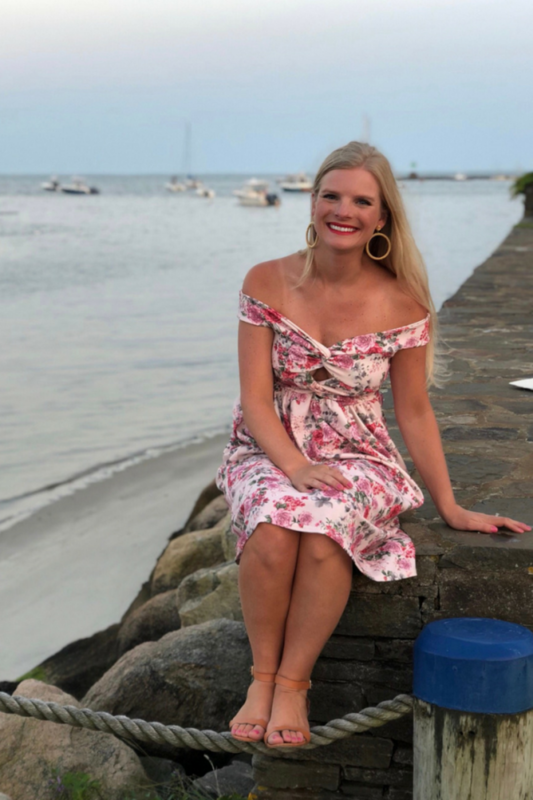 I picked out a few options on Rent the Runway but decided to take a look at a few other stores before making a decision. Last year, I found a dress I loved on ASOS from a brand called boohoo. 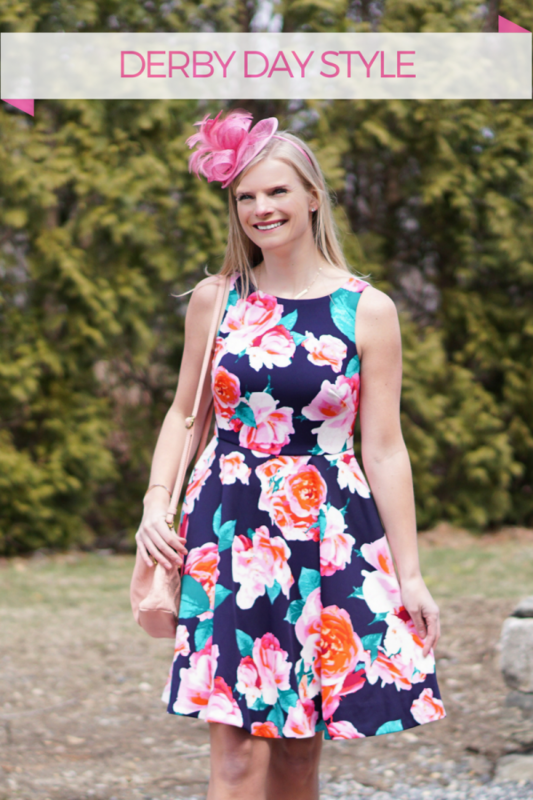 I realized they have their own site – oftentimes with 50% off like they do now – with lots of dress inexpensive dress options and free returns. I looked through the options and ordered two on a whim for $25 each – and luckily, I ended up loving one of them! 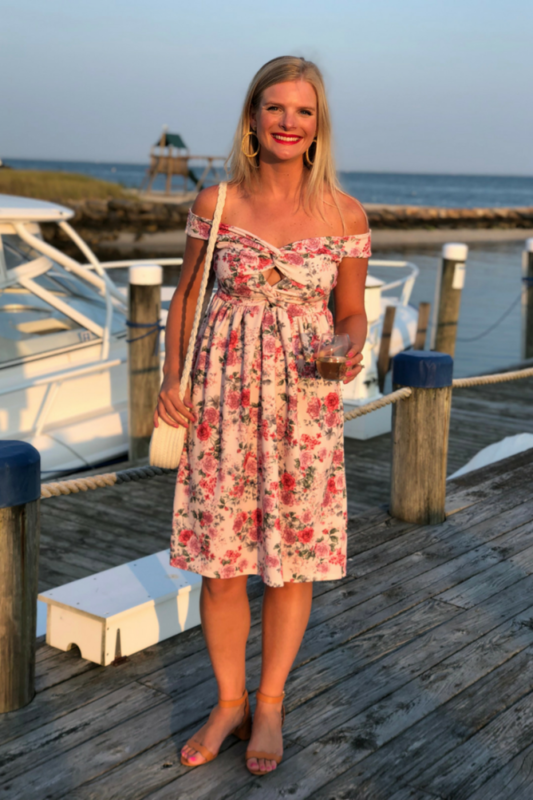 I got so many compliments on this off-shoulder floral dress and it was so comfortable because of the stretchy material and the fact that it wasn’t tight on my stomach (I like to eat, drink and dance at weddings!). Note that I’m usually a 2 or 4 but the smallest size available was a 6. I went with it and while I probably could have gone a size down, because of the stretchy material, I had no problem with the fit. Shop this dress using the links below and scroll down all the way for even more dress picks from boohoo. With the entire site 50% off, now is the time to try them out! And I’d love to hear your favorite places to buy dresses to wear to weddings – leave them in the comments! Ever since our wedding, I’ve been on the hunt for the perfect blue dress, similar to the color my bridesmaids wore. 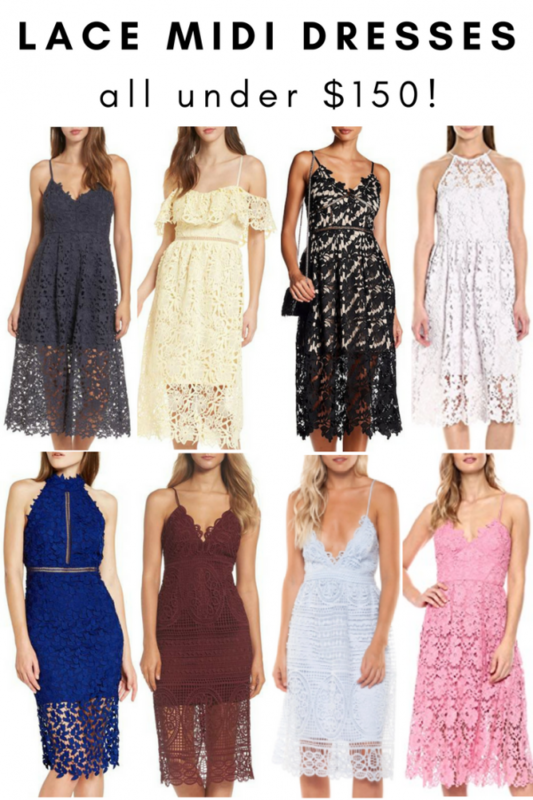 I found exactly that last summer – this lace midi dress, which was under $90. It’s a near-exact dupe for the popular Self Portrait Azaelea dress, minus over $200. I was tempted to grab another color when they launched fall colors… and now it’s back again with new colors for spring. They finally have the periwinkle color I’m wearing below back in stock, along with white (great for brides! ), black and several new colors, eggplant, lilac, mint, navy and red. This dress tends to sell out in various colors and sizes, but just keep checking back on Nordstrom until what you’re looking for is there. I’ve found that they are continually restocked and it just takes a bit of patience if you have a specific color in mind. But if you see the one you want, grab it before it’s gone! They are constantly launching and replacing colors, so you don’t want to miss your chance. I recommend you size up if you’re between sizes (I’m 5′ 8″ and got a medium). If you’re unsure of your size, you can easily order two thanks to Nordstrom’s free shipping & returns. While I personally think the cut of this dress is flattering on anyone, if it’s not for you, try this one. It’s the same brand, same price, but an off-shoulder ruffle style that comes in pale yellow and white. It’s a strong contender for an early summer wedding I’m attending! Along with that dress, I also tracked down lots of similar options to shop via the links and widget below. Click through the links because many of them have several color options available and are at pretty low price points. If you find any others, leave them in the comments for everyone to see! Not everyone has Presidents’ Day off today, but if you’re like me and do, then you should definitely take advantage of some of the great online sales going on right now. With foot after foot of snow here in New England, I’m dreaming of warmer weather, so today I’m sharing some jewel-tone dresses I’m loving from ASOS. Most of them are regularly $100 or less – and today you can shop everything on ASOS for 20% off with code PREZDAY20 (just click the links below to be directed to the dresses). They’re perfect for the fast approaching wedding season! What are your favorite wedding or special occasion looks for this year? Let us know in the comments below!